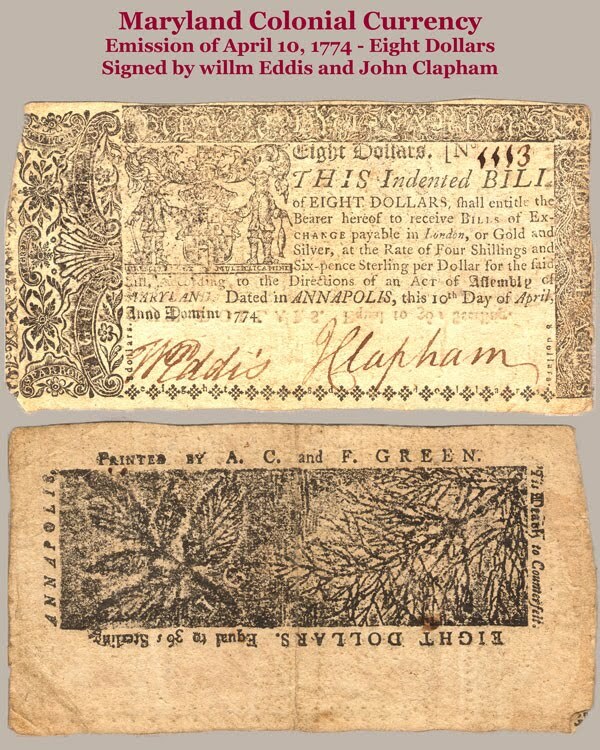 Last year, I wrote an article about the currency issued by the Maryland colony in the 18th century through the end of the Revolutionary War that was published of the Maryland Numismatist, the quarterly publication of the Maryland State Numismatic Association (MSNA). 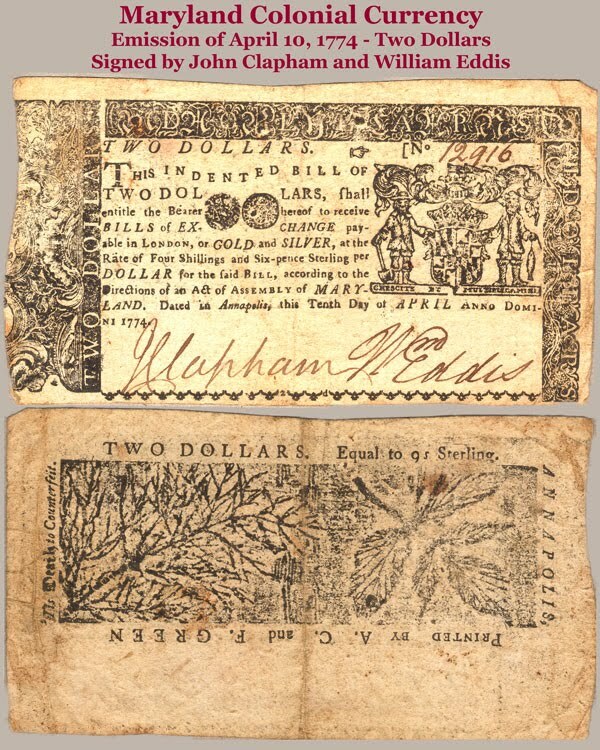 I became interested in Maryland colonial currency after stumbling over the Numismatic Collection in the Department of Special Collections at the University of Notre Dame and reading about Maryland currency on their Colonial Currency page. Discovering this information about Maryland Colonial Currency inspired me to do more research. The result was a presentation (PDF) I gave to my coin club. I was then asked to convert the presentation to an article that was published in the Spring 2010 edition of the Maryland Numismatist. It was selected as “Article of the Year” by the MSNA. After doing this research, I realized I did not own a piece of Maryland currency. After reading that some people were finding bargains during the holiday time period at one large auction house, I decided to spend my holiday gift money buying a Maryland note. I bid on a few notes hoping to win one. At the end of the auction, I won two notes! The notes I won are two-dollar and eight-dollar notes from the April 10, 1774 emission. These note were authorized by the Maryland Colonial Assembly. They authorized an emission of $480,000 of non-legal tender bills to be dated and issued on April 10, 1774. This emission. would be the last colonial issue before the Revolutionary War. The authorization was for $266,666 to pay loans, $80,000 for government expenses, and $133,334 to be exchanged for worn bills payable from October 10, 1785-April 10, 1786 at the rate of 4/6 sterling per dollar. An act of October 17, 1780 changed the exchange rate for all currency issued before 1776 to forty old dollars for one new dollar to be redeemed by March 20, 1781, after which all colonial notes were voided. Designs and denominations were similar to the March 1, 1770 issue. Anne Catherine and William Green printed these notes. Anne Catherine Green, whose name appears at “A.C. Green” on the note, took over the business following the death of her husband Jonas Green. Anne Green had to use her initials because it was not acceptable for a woman to be working as a printer in the 18th century. William was Anne’s oldest son. The notes were originally designed by Thomas Sparrow who created the border cuts for these notes. Numismatists studying coinage attempts for the government formed under the Articles of Confederation knows that Sparrow was involved in one attempt. In order to make these notes legal to issue they had to be signed by authorizing agents. The agents who signed these notes were John Clapham and William Eddis. Clapham was a landowner in western Maryland who served as sheriff (tax collector) of Anne Arundel County (Annapolis) from 1770–72. Eddis was a British loyalist, born in England about 1745, worked for Colonial Governor Sir Robert Eden as the office of surveyor of customs. Eddis fled to England in 1777. For being nearly 237 years old, these notes are in fantastic condition. Considering what the reference books say the notes should cost, I can say that I did very well with this purchase. It is a great way to start the new numismatic year!